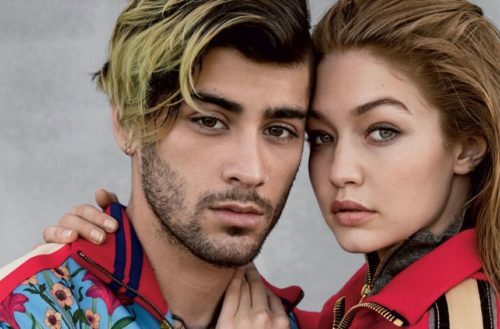 American Vogue just put Gigi Hadid and Zayn Malik on the cover of their latest issue, labeling them as the trailblazing celebrity couple making gender-fluid style the trend it is. We have to protest this claim. There are so many other celebrities that have actually made gender-fluidity flawlessly part of their existence and daily wardrobe. Hadid, maybe. But Malik? Not a chance. In the essay titled “Gigi Hadid and Zayn Malik Are Part of a New Generation Embracing Gender Fluidity,” Vogue writer Maya Singer begins with a meditation on Virginia Woolf’s Orlando, whose protagonist wakes from a long sleep to discover he’s switched genders from male to female. Vogue’s article claims that because the pair have shared tracksuits and t-shirts, they qualify as gender-fluid. The photo shoot only really features Hadid in any sort of gender-fluid look. Where is Malik in a dress? Heels? Can we get some lip liner, here? Or would that be too queer? There is also nothing creative about Malik’s or Hadid’s sexuality or gender identities. We’re not saying cisgender straight people can’t be gender-fluid, but to us, both celebrities seem pretty heteronormative and remain within the constraints of that definition. baby, stylin. ?? @zayn @voguemagazine @tonnegood @inezandvinoodh ❤️?? Who should have been on the cover? When we think gender-fluid, we think Justin Vivian Bond, Tilda Swinton, Ruby Rose (who was interviewed in the article), Andreja Pejić, Steven Tyler, Evan Rachel Wood, JD Samson and Jaden Smith. No Gigi, everyday you’re pretty much the same. If the cover featured Ruby Rose in a tux and Jaden Smith in a dress, something he wears in real life, we would praise this cover. But not this. Malik in a flashy printed suit, speaking of wearing his girlfriend’s baby doll tee is not enough to qualify a person as gender-fluid. Vogue is supposed to the harbinger of what’s next, but this type of inane pandering proves there is nothing new to actually see here.